+ WHY NOT JUST TAKE PHOTOGRAPHS? Regardless of the type of photography you use, features as depicted in THE LADDER cannot routinely be captured. Variables of lighting conditions, exposure, processing, monitor calibration, and/or change in media impact the quality of your communication. Images in THE LADDER have been modified and enhanced in order to accurately display features as they appear clinically and eliminate relativity. + WHY SHOULD I USE THE LADDER? 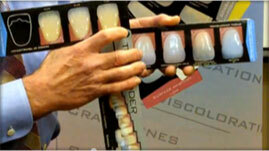 Because it provides a standardized language between dentist and ceramist that is always 1st generation communication. There is no loss of detail that is common with photography and/or subjectivity associated with schematics. THE LADDER complements shade scanners and is a low cost solution to the expensive problem of match-related re-makes that cost hundreds of dollars for the dentist and laboratory. + WILL IT TAKE A LONG TIME TO LEARN THE LADDER SYSTEM? THE LADDER is categorized, color coded, and encoded for easy reference. THE LADDER takes what you already know and gives you a tool to use it. Our experience shows – not long! + IF IT IS SO SIMPLE, WHY HAS NOTHING LIKE THIS BEEN DONE BEFORE? To make a solution this simple is involved and difficult. The process of categorizing features to exact standards involved hundreds of hours of research and a greater amount of time to digitally construct true-to-life and color accurate images. The simplicity is in its use, not in its creation. + WHY DO THE LAB AND DENTIST NEED THEIR OWN COPY? THE LADDER communication system requires the identical image to be viewed by the dental office and dental lab — it is a partner device! The benefit to dentists and ceramists is to work with identical images from different locations. In addition, the dentist and/or technician can document diagnosis and/or fabrication at their own location. + HOW DO I KNOW THE SYSTEM IS COLOR ACCURATE BOOKLET-TO-BOOKLET? It has to be, because that is the key to the system. The production methods incorporate existing standards such as Pantone colors, archival photographic paper, and the highest quality 4-color lithography available. In addition, each booklet is visually checked by color professionals under varying light conditions to ensure accuracy and each booklet is numbered for quality control. + AS A LAB, WILL IT BE DIFFICULT TO REPRODUCE THESE CHARACTERISTICS? Taking the guesswork and uncertainty out of the fabrication process allows you to focus only on matching the characteristics specified by the dentist. Repetitive use of THE LADDER makes reproduction of characteristics a simple process. + MY LAB IS NEXT DOOR – WHY DO I NEED IT? THE LADDER is a standardized unchanging reference. It simplifies documentation of features for later reference when the patient is not available. + HOW DO I BECOME A LADDER PARTNER? As a dental laboratory, your lab will automatically be listed as a LADDER PARTNER following your initial purchase. As described in the LADDER ASSOCIATE section, purchase of 10 or more sets qualifies your lab to have a direct link from the LADDER web-site to your own web-site. This referral list is available for dentists seeking laboratories using THE LADDER.